“The bees are coming!” said the hotel. If you have been a beekeeper for a long time, you will remember the days when you had to hide your nasty habits (and your nasty bees) from the public. Bees were once very uncool. The Africanized bees terrorized America. One wasp at a picnic was a swarm of angry honey bees in the eyes of ordinary concerned citizens. But times have changed. (Except at the White House lawn – see the story just below.) Last month, I spent a weekend on Vancouver Island, partly a business trip, partly a family holiday. Our hotel – the Chateau Victoria – was fine, reasonably underpriced, and close to the work I needed to do. It is an 18-story building in the Inner Harbour area and it has a restaurant and resident hives of bees. I didn’t see the bees, but I saw a sign about them. It was posted in one of the elevators and I reproduced it for you here. In the recent past, a hotel would not announce the arrival of bees. It might not even admit that bees sometimes visit flowers on the property. But these days, the executive chef serves locally produced honey (very locally produced – the bees are kept at the hotel) and guests are invited to celebrate the arrival of the buzzers. And to buy hotel honey. This is progress. Another piece of progress worth celebrating is a fantastic garden a few minutes’ drive north of downtown Victoria. Butchart Garden’s beautiful spring flowers – lots of hyacinths, tulips, azaleas, daffodils – were a delight. 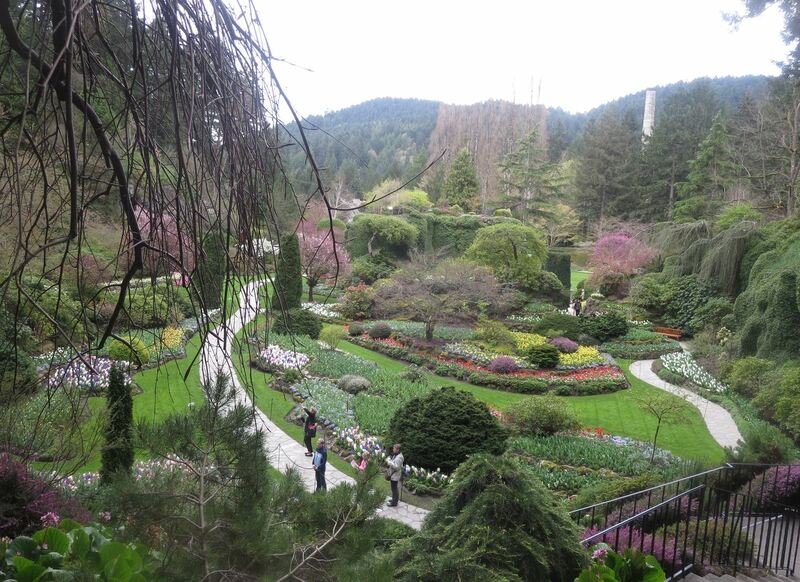 But I was intrigued with the history of Butchart Gardens. One hundred years ago, the Butcharts made a fortune by digging a huge hole in their backyard. They excavated limestone, set up furnaces, and produced cement. When mixed with beach sand and stream gravel, the family’s cement made the concrete that built Victoria. Mrs Butchart found the dig rather unsightly. The family had lots of money and a nice mansion, but Mrs Butchart was surely the first person to have said, “Not in my backyard” when the limestone quarry started. NIMBY (Not-in-my-back-yard) is a common enough expression these days when citizens try to keep drug rehab centres and recycling stations out of their neighbourhoods – while admitting this are good and necessary things that should be built in some other neighbourhood. Mrs Butchart of the Gardens was stuck with her ugly stone pit so she went about decorating it. She turned the quarry into a ‘Sunken Gardens’ and hired a native of Japan to design the nearby Japanese Gardens. An Italian landscaper built the Italian Gardens while elsewhere on the property someone named Rose planted a rose garden. That was a century ago. Today, people pay thirty dollars or so to stroll around the grounds for a day. It has become the iconic Canadian gardens and it proves that abandoned stone quarries can become things of beauty. As Mrs Butchart might have said, “If someone hands you a hole in the ground, plant a garden.” Of course, it helps if that hole in the ground made you a millionaire. This entry was posted in Beekeeping, Strange, Odd Stuff and tagged Butchart Gardens, Chateau Victoria, Victoria. Bookmark the permalink.